Xcaret Park is one of the most famous attractions in the Cancun-Riviera Maya destination, an eco-archaeological park where you can experience the natural and cultural richness of Mexico. Get up to 15% off Mexico Tour. Restrictions may apply. Book by 01/31/2019. Father’s Day! Get $5 off real mexican party at Xoximilco. Happy Father’s Day! Get 15% off Xoximilco. Save 50% on children admission and second day visit free when you purchase with MasterCard. Happy Father’s Day! Get 15% off Tour Xenotes. Get up to 15% discount on swim with dolphins in Xcaret and Xel-Ha. Restrictions may apply. Book your tickets and get 5% discount in Tous boutiques of Luxury Avenue. Save Up to $147 + 50% Off Children under 12 years Tour Packages with the Best Tours in Cancun, Riviera Maya and Yucatan. Visit merchant’s site for more details. Get $5 off entrance or tour to Xplor Fuego. Restrictions may apply. Limited time offer. Get $5 off any of the 2 tours. Get $5 Off entrance or tour to Xichen. Restrictions may apply. Limited time offer. Get 10% off Expedition Tours. Get $5 off Semana Santa ES 2018. Restrictions may apply. Get $5 Off entrance or tour to Xoximilco Cancun. Restrictions may apply. Limited time offer. See website for more details. 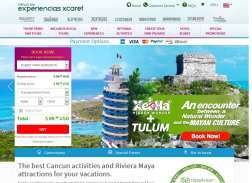 Get 10% off booking at Xcaret tour. Get Free 2nd Day visit if you use HSBC card. Restrictions may apply.